Although the castle is believed to have been built at the millenium, the first documentation of Schloss Mühldorf dates back to 1347 under “Niklas the Mühldorfer.” Some of the more prominent families who owned the castle were the Lichtensteiner and Oberwallseher families. In 1747 the Cistercian Abbey of Wilhering came into possession of the estate and retained it until 1980. During World War II, collections from the Provincial Museum in Linz were kept here for safe keeping. Privately owned once again, the Würmer family has opened their castle estate as a comfortable hotel in the Danube Valley. For those who love bicycle touring, one of the most famous (and gorgeous) bike routes in Europe follows along the Danube River from Passau, Germany, to Vienna. The trail passes right by Feldkirchen, so if your muscles are already aching, you’ll find Schloss Mühldorf the perfect splurge. Next to the castle estate is a professional football pitch, and often teams come here for training. Cars are the best way to enjoy the surrounding area. Feldkirchen a.d. Donau is about 20 km. west of Linz on the northside of the Danube, and Schloss Mühldorf is about 2 km east of Feldkirchen. Leave Linz on B127. After 10 km, left on B131. Left again on L1506 for Mühldorf. 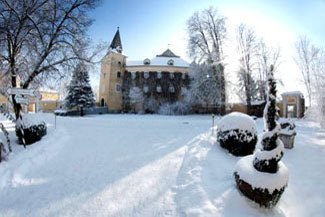 Schloss Mühldorf is a traditional, family-run hotel located in a rural area in the Danube Valley. Although the castle dominates the estate, the reception, guest rooms, and restaurant are installed in the surrounding buildings. A romantic and centuries-old ambience reigns throughout, helped in part by the warm and friendly staff who take time to chat with you and offer suggestions to enjoy your stay. Want a picnic basket filled to take with you for the day? Just let them know. A number of villas hold the guest rooms (note: no guest rooms are inside the castle itself). At the Meierhof, which was a former stables, you’ll find a few of the suites, four double rooms, the small spa, shop, and reception. There are further guest rooms at Verwaltungstöckl and Villa Cristina. At the Villa Ariana, guest rooms feature balconies and views of the garden. Each guest room is spacious and individually decorated with a good blend of traditional and modern comforts. Some rooms have vaulted ceilings, beamed ceilings, or stone walls. Bathrooms are contemporary and have a shower or bath. After the hotel’s excellent breakfast or the tea and cakes served in the afternoon, you’ll be glad for all the walking trails in the area! For a romantic, candle-lit dinner, under a grand vaulted ceiling, try the restaurant in the Great Hall. Afterwards, a seat in front of a log fire is a perfect place to enjoy a drink.